Arts Jam! is back for the cooler months after a summer hiatus. Relocated to the first Monday of the month since last year, the “news and views” gathering is an opportunity for member groups and businesses, individual members, visitors and board members, to share what’s going on in the local arts community. It is not a business meeting! Come to share and hear what art is happening in the area. It’s a great time to plan your season around exciting arts events and workshops. It’s also a great time to reflect on wider artistic issues: bring your views on arts in the current media. There is always coffee, tea, and refreshments. For visitors, it’s a fun way to become immersed in the local art scene and meet some great people. Next up at Arts Jam! 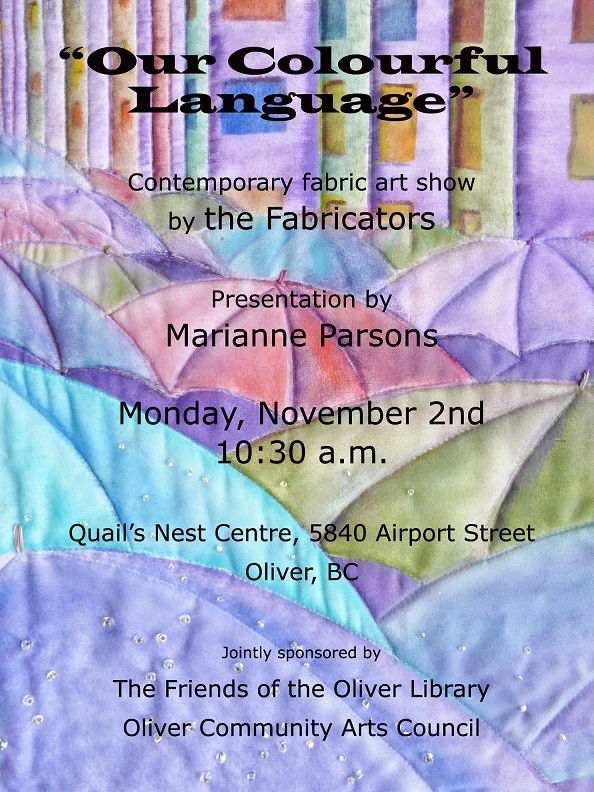 : “Our Colourful Language”, a presentation by Marianne Parsons and hosted by the Friends of the Oliver Library. Arts Jam begins with news from attending member groups and businesses. Tell us about your fall / winter event. Flyers welcome! Some news from the Board is included. Take a look at the new Memorial Bench and concrete pad now in place. Following 45 minutes of regular Arts Jam and a refreshment break, Marianne Parsons will inform and delight you with a slideshow presentation entitled “Our Colourful Language” based on recent exhibitions by The Fabricators, a highly regarded group of regional fabric artists. Upcoming Arts Jams: February (together with the AGM mid-month) , then back to first Mondays in March, April, and May.